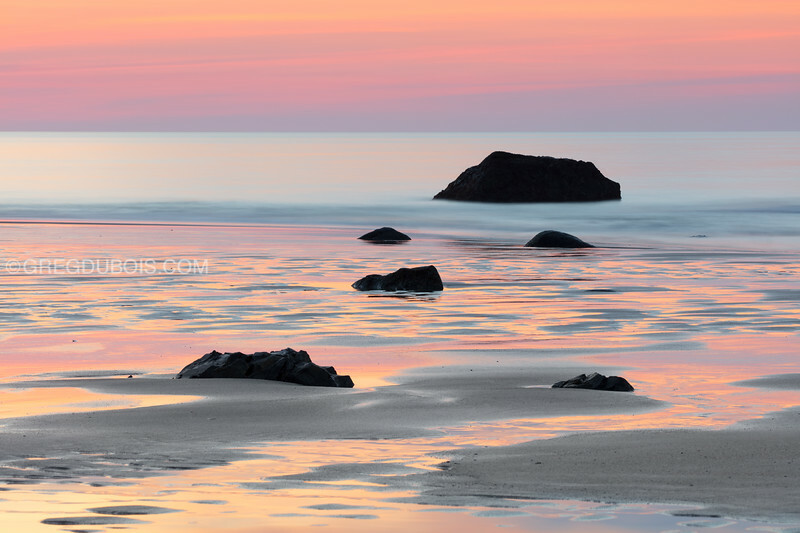 Hampton Beach New Hampshire as seen at low tide during sunrise on the second day of spring (2019). There are many natural rocks embedded into the sand on the north end of Hampton Beach, at the base of Boar’s Head. I’ve read these rocks were deposited by a glacier around one million years ago, from as far away as the Ossipee Mountains. This is my favorite rock grouping that can only be seen at low tide, and on this calm morning I got beautiful reflections on the wet sand. This image is focus stacked front to back on the rocks, and I intentionally omitted the foreground and background, in favor of a soft lead-in and lead-out of the composition.